In April, thousands of green ribbon-wearing protestors took to the streets of Bangkok, as well as the northern city of Chiang Mai and other towns around Thailand, in one of the largest civil rallies the ASEAN member state has seen since General Prayut Chan-o-cha's military junta wrested control of the nation from a caretaker government led by former Prime Minister Niwatthamrong Boonsongpaisan in 2014. At first glance, these demonstrators – who staged their protests despite a ban on public gatherings of more than five persons – risked arrest and detention for up to three years. The protest was not for political ideals or loyalty to the previous administration but for defending environmentalist principles centred around the preservation of woodlands surrounding Chiang Mai's sacred Doi Suthep mountain. However, the demonstrations, which erupted following the circulation of images depicting the construction of homes for government officials in forested land adjacent to a national park on the mountain held to be a sacred site and conservation area by locals, belie deeper tensions arising between the National Council for Peace and Order (NCPO) and the people of Thailand. At least one billion baht (US$32 million) has been spent to date on this development, which is reported to comprise of nine homes for court presidents, 36 homes for chief justices, and 13 apartment buildings for court officials of the 5th Regional Appeals Court, as well as office components. While the project, which was 98 percent complete as of April, was constructed legally on a patch of government land, the resulting deforestation, as well as its proximity to Doi Suthep and the Wat Phra That Doi Suthep, a sacred Buddhist temple said to hold a relic of Siddhartha Gautama, has sparked controversy nationwide. 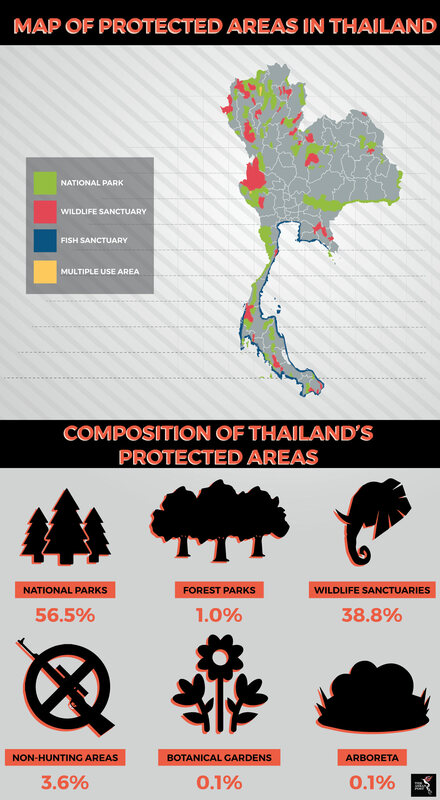 A poll conducted by Thailand’s National Institute of Development Administration from 21 to 23 April found that 85.2 percent of respondents felt that the project was detrimental to the surrounding forest, eco-system and nature at large. The survey, which gauged the sentiment of 1,250 participants aged 18 and above throughout the county, also found that the majority (37 percent) felt that construction should be halted, the homes demolished and the area reforested. Other proposed solutions include the completion of construction, with the further development of the site for public use (25.9 percent) as well as halting construction with the selective demolishment of buildings considered detrimental to the environment (22.9 percent). Of those polled, 81 percent were aware the court housing was legally approved, with 14.5 percent agreeing that the project was justified and did not constitute forest encroachment. While environmentalism and heritage conservation played a part in the nationwide protests surrounding Doi Suthep, they also point towards growing frustrations toward perceived privileges for Thai elites and officials. At an academic forum held on 20 May at Thammasat University, participants argued that the NCPO had turned Thailand’s environmental protection policies into tools to tighten the military junta’s grip over the country’s natural resources. The majority of participants at the forum agreed that public participation in decision-making had decreased under the NCPO administration, with the council exercising far greater control over the nation’s resources on behalf of investors and elites. “The military have always got involved in matters of environmental protection throughout history, as they count the environment and natural resources management as another aspect of stability,” said Mahidol University Institute of Human Rights and Peace Studies lecturer Benjarat Sae Chua, speaking at the forum. The military junta’s forest reclamation policy, launched on 14 June 2014 via NCPO order 64/2557, was introduced with the goal of reversing deforestation in Thailand, which saw forest cover declining from 61 percent in 1945 to 34 percent in 1975. However, its implementation has drawn criticism due to reports of forced evictions of thousands of villagers in officially designated forest areas, despite a subsequent directive (NCPO order 66/2557) issued on 17 June exempting low-income or landless residents. Speaking at the Thammasat University forum, Environmental Litigation and Advocacy for the Wants Foundation manager Supaporn Malailoy also speculated that the NCPO had utilised its powers to suppress environmental protection measures to benefit mega-project developments and industrial growth. “There are many NCPO orders that allow harmful projects – such as coal-fired power plants… to proceed much more easily by ordering them exempt from laws and regulations that restrict development for [environmental] reasons,” she said. In this light, the demonstrations of thousands of protestors in April, which included a two week-march from Chiang Mai to Bangkok, can be interpreted not just as a protest against the Doi Suthep housing project – dubbed the “Scar of Chiang Mai” – but also as a statement against perceived excesses on the part of the NCPO ahead of Thailand’s upcoming general elections in February 2019. It remains to be seen, however, whether this apparent capitulation is part of a larger strategy of appeasement on the part of the NCPO, which has stated that it is preparing for a return to democracy next year, or whether it represents a fundamental shift in the military junta’s recognition of sustainable environmental conservation efforts in Thailand moving forward.